From death row to the mansion of a head of state, small kitchens and front parlours, to legislatures and presbyteries, Anna Bryson and Seán McConville’s wide interviewing experience has been condensed into this book. The material set out here has been acquired by trial, error and reflection over a period of more than four decades. The interviewees have ranged from the delightfully straightforward to the painfully difficult to the near impossible – with a sprinkling of those that were impossible. Successful interviewing draws on the survival skills of everyday life. This guide will help you to adapt, develop and apply these innate skills. 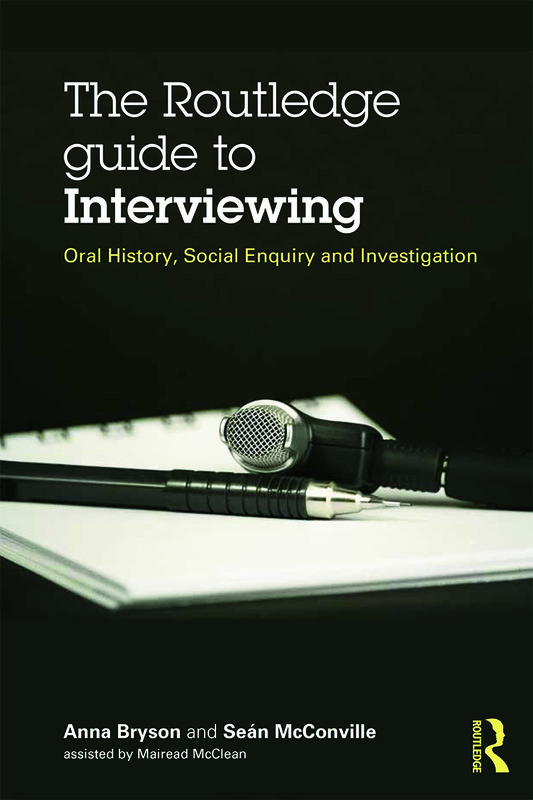 Including a range of useful information such as sample waivers, internet resources, useful hints and checklists, it provides sound and plain-speaking support for the oral historian, social scientist and investigator. Preface. Introduction. 1. Thinking Ahead 2.Ethics and Legalities 3. Resources 4. Groundwork 5. Developing Technique 6. Special Care 7. Shifting Focus 8. Storage 9. Analysis 10. Possibilities. Credo. Anna Bryson is Research Lecturer at Queen Mary, University of London. She has considerable experience of conducting interviews for social and historical investigation. Recent publications encompass ethnographical research on Northern Ireland, prison diaries, biography and criminology. She has advised both statutory and private organisations on the design and implementation of complex interview-based projects. Seán McConville is Professor of Law and Public Policy at Queen Mary, University of London. He has researched and taught at leading universities on both sides of the Atlantic. His interests and publications range widely, from Islamic criminal law to prison architecture, but have clustered around the philosophy and administration of punishment – historically, comparatively and in current debates. His publications include Irish Political Prisoners 1848-1922 (Routledge, 2003) and Irish Political Prisoners 1920-1962 (Routledge, 2013).